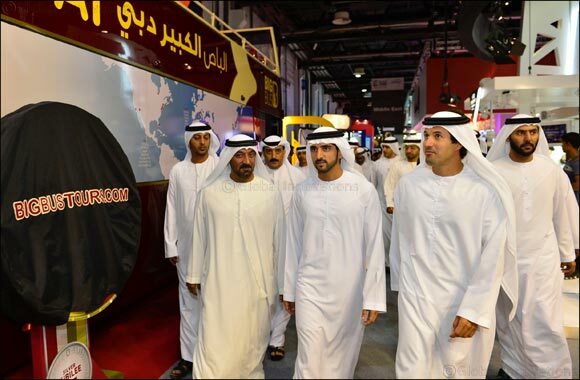 Dubai, UAE, April 26, 2016: His Highness Sheikh Hamdan Bin Mohammed bin Rashid Al Maktoum, Crown Prince of Dubai, officially inaugurated Arabian Travel Market (ATM) 2016 today, marking the start of the 23rd edition of the show. He was joined by dignitaries including His Highness Sheikh Ahmed bin Saeed Al Maktoum, Chairman of Dubai Civil Aviation Authority and Chairman of Emirates Group and Helal Saeed Almarri, Director General, Dubai World Trade Centre Authority (DWTCA) and Dubai Department of Tourism and Commerce Marketing (DTCM) and who embarked on a tour of the exhibition as the four-day industry showcase got underway. Nick Pilbeam, Divisional Director – Travel, Reed Exhibitions was also in attendance. This year’s show, which is taking place at Dubai World Trade Centre from 25-28 April 2016, welcomes 423 main stand holders representing 86 countries, with more than 26,000 visitors expected to attend. Boasting an extra hall, ATM 2016 has more than 2,800 exhibiting countries and 64 national pavilions, with 100 new exhibitors making their debut at the trade event.